A few weeks ago, I headed to Grand Rapids on a Friday night to spend the weekend with my husband’s family for his birthday. On Saturday, I had to take a side trip towards Mt Pleasant for the fall MIKE workshop. Very excited for some of the ideas I got! However, while I was in Mt. Pleasant, the Tylenol sinus I took for that little twinge of something wore off and all of a sudden, I was a runny, drippy mess. See below. And I wrote it off to my typical sick-and-work-through-it-like-always. Thanks to Jen from Noteworthy by Jen for this lovely photo of me (If you check out my instagram, you can see her having some fun at the workshop! Anyway. I got back to Grand Rapids and ended up sleeping most of the day away, and while I’m feeling little better now, I’m still under the weather. But it’s THAT kind of under the weather. You’re cold, you’re hot, but you don’t have a fever. You are drippy and scratchy and pretty miserable, but you know it probably isn’t even contagious. Truthfully, unless you are taking something for sinus pressure, it isn’t even worth it because it doesn’t do anything. And you KNOW it isn’t worth taking a day off. Then I saw this and really started thinking about how much teachers go to work when they feel lousy. In a music teacher situation, you get the kids a little hyped already. Photo credit to The Teacher Next Door. Click the photo to visit her FB page. Here’s my cope method for when I’m sick, but can’t bring myself to give up a sick day for something ridiculous like a short cold in September. If you are using the random tissues at school for a nose that DOES NOT STOP, you are going to be red quickly. I’m all about the Puffs with Vicks and Lotion. If I’m sick, I may bring a box with me, just so I have a little relief. Hot water with lemon and honey is all well and dandy, but at school, there’s not time to make yourself nice little cups of this. The Swell water bottle is perfect for this (Mine is a little dented – I drop it, a lot. But it’s COMPLETELY worth the money). It keeps the hot hot and the cold cold. They are a little expensive, but if I can put hot water in my bottle at 8:00am and drink hot at 2:00pm, I think it’s worth it! Unfortunately this doesn’t work if it’s hot outside, or you have a REALLY warm room. But having something cuddly around your neck and a nice warm sweater definitely helps me a little better. At least it helps me fight off the cold! This sounds like the worst advice ever, I know. And I’m not talking full face contouring. I’m not a beauty blogger for a reason. However, doing a little makeup – mascara, concealer and some lip gloss, can work wonders if you feel like junk. If you go to school sans makeup in a blanket scarf and sweater with hot water and a box of tissues, your gonna look SICK. (Like – “You must have a fever, why are you here?” sick.) I’m a strong believer in mind over matter. If you have a minor cold and your head to toe wrapped up and you have a little big of makeup on, the you just look cozy. It’s a state of mind. Having a few ‘backup’ plans that don’t involve you teaching folk dances full force can be a savior. If you know you have to do something pretty involved with 4th grade (See: folk dancing), but you are working on reading rhythms with 3rd grade, why not pull out something that makes it a little less work for you and actually more intensive for the kids? 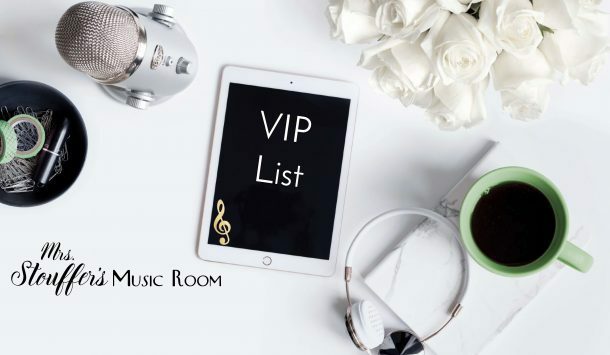 Instead of holding rhythm cards up while the kids clap, play a rhythm game that doesn’t involve you standing, holding cards, and trying to shuffle them around, read upside down to make sure it’s right and passing out rhythm instruments too. Here’s some great lesson plans for when you are sick, but still in school. 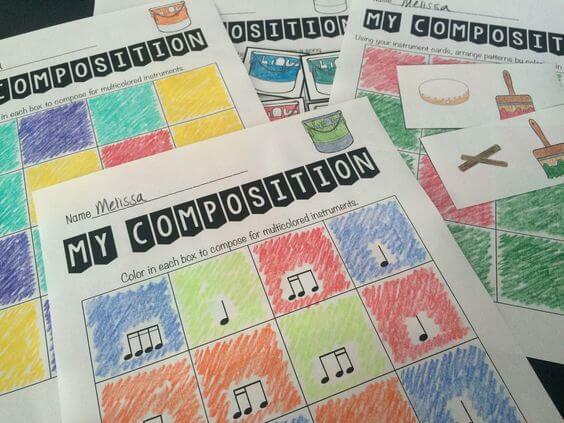 Shape Composing and Color Composing – If you can handle the noise, this allows kids to apply what they know. In Shape Composing, meant for your littles so they don’t have to ‘write’ the music, they compose by drawing shapes. Students can create patterns, and even use some rhythms instead of steady beat. 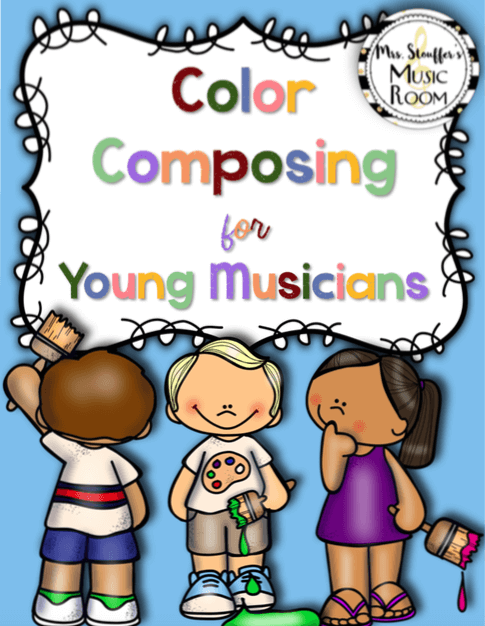 In Color composing, students can use pitched instruments by color coordinating, or simply write patterns for unpitched rhythm instruments. These are the kind of days I also love playing games that allow students to practice a concept while I assess. It definitely allows me to not phone in what the kids do, but also assess and not have to be up and be someone’s partner in a fast moving folk dance, or make sure a game is played without getting out of control. The big one is that it allows me to not have to sing! And while this is something I would plan either way, it’s great on those days without a voice, or feeling really under the weather. King of the Pumpkin Patch is a play on King of the Mountain – it’s a fun game that really relies on steady beat. I love being able to bring in the holidays/seasons in small ways like this rather than taking a lot of time to sing a song specifically because it is seasonally appropriate. Here’s some of my kids playing King of the Pumpkin Patch last week. What are your tips for when you are sick at work? Hey! Sorry for the long time on the reply! The game is played like King of the Mountain. One student is chosen to be the King/Queen (Drawing popsicle sticks makes this so much easier!). The person to their right is the next highest player on the mountain (2nd place). The person to that person’s right is the 3rd, and this continues all the way around so that the person to the King’s left is in last place. The goal of the game is to work your way up to the top of the mountain and be in the king’s position. The king starts the game by reading their card, with a steady beat, as well as the card of another player from anywhere in the circle. The player who’s card is read must then read their card and then another player’s card. This continues until someone makes a mistake. The rhythms on the card must be read with a steady beat and without missing a beat in between players. If a player makes a mistake, they go to the bottom position in the pumpkin patch (the seat to the king’s left) and all the other players advance up a position. The cards stay in the same place, and do not move. Only the players change position. The king starts the play again, once everyone has changed position. Play can continue as long as the teacher wishes.